When you hear the word rebar, what is the first thing you think about? If you are not in the construction industry, you may be a little unsure, so here is a bit of background information on the topic. Rebar, also known as reinforced steel bar, is one of the most common materials in the construction industry. It is embedded in concrete structures (i.e. buildings, bridges, etc.) to help them keep their shape, and to prevent the concrete from cracking over time due to pressure and the natural process of contracting and expanding, which can be a result of changes in the environment. Now that you know a little more about what rebar is, what would you say if we told you that many businesses (and their designers) have used it for a completely different purpose? As crazy as it may sound, rebar has become increasingly popular as a design element. As such, many commercial establishments such as bars and restaurants have incorporated the material into their building designs and art. When equipped with the proper tools and a creative mindset, anything is possible. We have taken the time to track down some of the best rebar designs, as this is still a new niche that hasn’t received the amount of attention we rebar enthusiasts think it deserves. Metal does not have to be cold and ugly; it can be an art form like anything else, which is exactly what these businesses demonstrate so beautifully. 1. 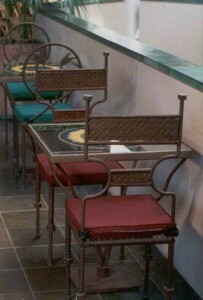 Believe it or not, but the steel frame on these chairs is actually comprised of molded rebar, not wood or plastic. We have to give our compliments to the person who did this, as the unique bends are quite impressive. We also like the fact that they added the rounded edges on the top. When manufactured, sticks of rebar are often sharp and jagged. This business obviously took the time to make sure their customers wouldn’t be put at risk while seated in these unique chairs. 2. 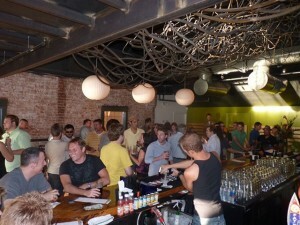 Located in downtown Phoenix, BLISS reBAR is one of the first bars in the United States to fully incorporate rebar into not only its name, but also its design template. 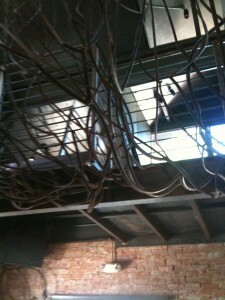 These pictures are just a small amount of the impressive rebar artwork they have on display. 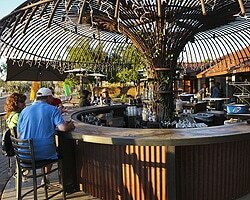 We think the rebar umbrella bar is magnificent and unique. This place is hip, located in the urban core, and is quickly becoming one of the hottest places to mingle and have a drink at in Phoenix, thanks in large part to the impressive incorporation of rebar into its design. In case you were wondering, that decorative hanging mass is not made out of wood! This clever design sports a number of sticks of rebar that have been custom bent and molded, which likely took a significant amount of work with a rebar bender. Talk about creating something unique! What we like most about this picture is that it is simple and stylish. 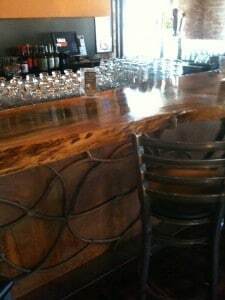 The type of wood used for the bar counter and the metal frame on the chairs complements the ornamental rebar perfectly. You can tell that the contractor eliminated the rough edges to craft a smooth steel surface. It also looks like they applied a copper color coating. 3. 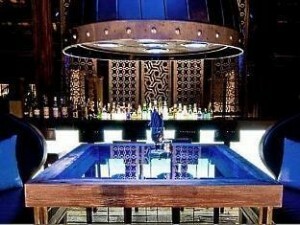 Located in Thailand, this next interesting rebar attraction is actually located in an elegant hotel bar. We would have never guessed it though, as the amount of detail that went into the design makes it seem more like a high-end nightclub. The color palette and the craftsman ship used to work the rebar is spot on; notice how the blue looks beautiful against the rebar backdrop? Do you enjoy rebar art? Share some of your favorite rebar inspired art pieces or locations that incorporate rebar into their design with us in the comments!